Allergy Season Is Among Us: Is Your Home Ready? AC Care: Time for a Tune-Up! The official start of spring happened a little over a week ago, and that means warmer temperatures are on their way! Soon enough, you’ll be enjoying the summer sunshine, and hopefully getting a fun vacation or two in. But, is your home ready for the rise in temperatures? What if you have repair needs you’re not even aware of? A broken down air conditioner is the last thing you need as we inch closer to the hottest time of the year. Of course, most air conditioner problems can be avoided if you schedule your AC maintenance appointment this season. Read on to learn more about why you should schedule maintenance now, versus waiting a couple months or longer. Delaying your next AC maintenance appointment for too long can leave you with costlier and inconvenient needs later on. 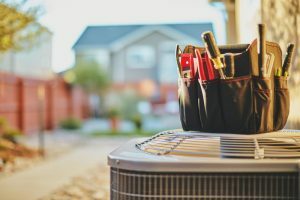 First off, if your air conditioner is completely broken down before the season even begins, it certainly won’t do you any good—you’ll be scrambling to schedule repairs. Additionally, operating an inefficient air conditioner can lead to a chain reaction of issues for your cooling system, not to mention it’s bad for your wallet. The last thing you need in the middle of a heat wave is for your air conditioning system to suddenly break down on you. A malfunctioning air conditioner, after all, could leave you pretty uncomfortable during our hot and muggy summers. In situations like this, it is far better to be proactive than reactive. Scheduling your AC maintenance session now helps ensure your AC system keeps functioning as reliably as possible, getting you through the hottest summer weather with ease. You should never have to sacrifice your comfort for a suffering air conditioner that can completely break down at any minute. Too often, people wait until the last minute to schedule their annual tune-up. Or, they wait until summer is already at its hottest. Typically, this is when local HVAC technicians are scrambling to answer emergency repair calls, making it harder for you to schedule a tune-up when it’s more convenient for your schedule. Getting maintenance on your schedule now ensures you’ll be able to make an appointment at your leisure, and also gives you plenty of time to schedule repair needs if they crop up during maintenance. There are a couple of small maintenance tasks you can do on your own to prep your cooling system for summer weather. For instance, you can look around the outside unit, collecting and disposing of any debris that’s settled on and around it, as this can negatively affect airflow. You can (and should) also change the air filter. This component is typically shared between the furnace and the air conditioner, so it needs to be changed every 1-3 months to prevent airflow issues and other damage to the HVAC system. To truly protect your system though, and to help retain its efficiency, you’ll want to hire a trained and experienced professional to perform maintenance. That’s what we’re here for! Contact Covenant Heating and Cooling today for quality maintenance and air conditioning repair in Nashville, TN. We are dedicated to the promise of serving you!